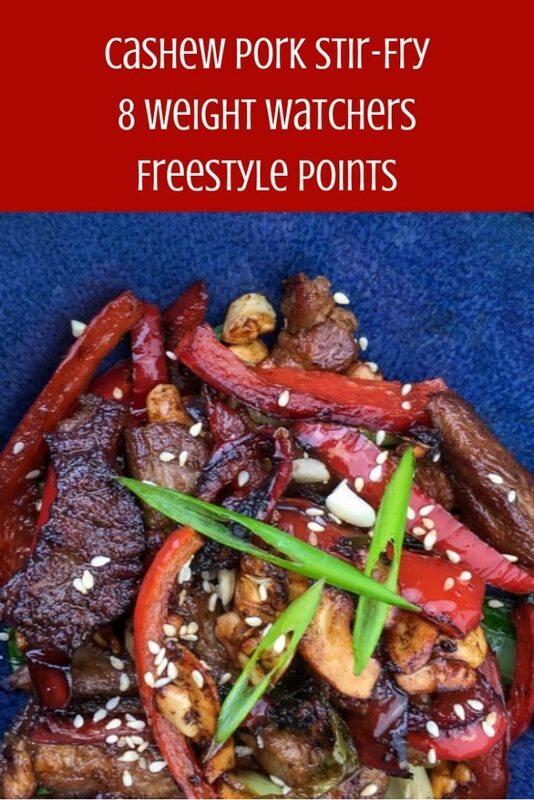 Looking for an easy recipe that is low in Weight Watchers Freestyle points, easy to make, and a hit with the entire family? 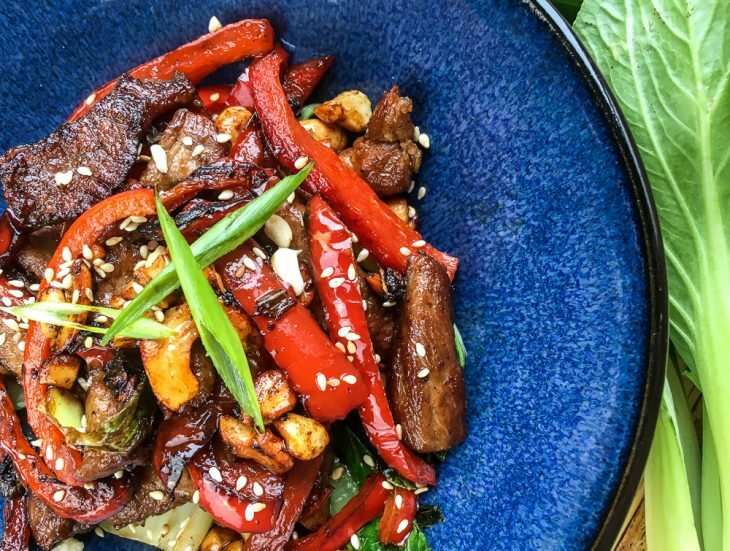 Give this cashew pork stir-fry recipe a try. This is a recipe that can be on the table in under 30-minutes –I love recipes like that. Please note: If you are following the Weight Watchers program be sure to use the leanest pork shoulder you can find. Another tip, reduce the cashews to a 1/4 cup and it will reduce the points to only 7 freestyle points per serving. I know I have days were every single point matters so I’m always looking for ways to cut out any excess points. Serve over cauliflower rice for no additional points or serve in a lettuce wrap. Heat the olive oil in a wok or a large frying pan with high sides over medium-high heat. Add the pork and cook, stirring occasionally, until the pork is nicely browned on all sides, around 3-4 minutes. 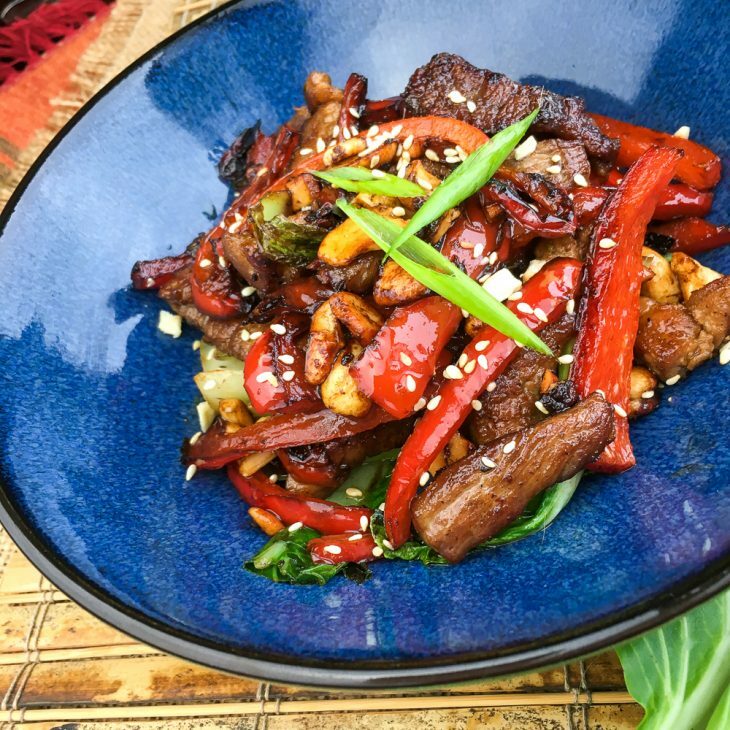 Add bell pepper, green onion, ginger, cashews, and garlic powder. Season with salt and black pepper, to taste. Stir-fry the veggies until they become crisp-tender, around 2-3 minutes. Add the bok choy, sesame oil, and tamari. Continue to stir-fry until the bok choy wilts and the other ingredients are coated, approximately 1-2 minutes. Remove from heat and transfer to individual serving plates. Garnish with toasted sesame seeds, if desired, and serve immediately. Enjoy!